One of the benefits of Australia arguing over what should be its capital (and ultimately creating Canberra for that purpose) is that Melbourne and Sydney seem to be perpetually competing to be seen as the country’s top city. Comparisons between the two by tourists are common, but nobody does it more than the inhabitants of the cities themselves. This real but friendly rivalry is excellent news for residents and visitors alike, as each city strives to out do the other and provide the best possible place to live, work, and explore. For me Sydney has more of the iconic sites – if you ask people to conjure up an image of Oz the white sails of the Opera House to the left of the Sydney Harbour Bridge will be at the top of most lists – but Melbourne has a stronger sense of character. Often referred to as the City of Villages, over time Sydney has expanded to encompass a huge number of previously distinct communities that have now become suburbs. However unlike other places (such as London) which have done the same, Sydney still seems to be lacking that real consolidated central hub which encompasses the key components for tourists. There is nothing comparable to the relatively small area from London’s Southbank up to Oxford Street which contains the Eye, the Thames, Westminster, Whitehall, Trafalgar Square, Buckingham Palace, St James’ Park, Green Park, the edge of Hyde Park, Leicester Square and Piccadilly Circus all within a couple of square miles. I’m not saying it’s a problem, and I have very much enjoyed all the time I have spent in Sydney. However if you have the right expectation before you go – that this City of Villages lives up to its nickname and the things to explore are spread out – you won’t spend time searching for something that isn’t there. Instead you can get straight on with exploring the harbour, discovering the Rocks, walking across that iconic bridge and generally enjoying all the excitement Sydney has to offer. Like Melbourne, Sydney is not a cheap place to visit. Meals and drinks out tend to be on the dearer side, and most places have a 15-20% surcharge on public holidays. The higher pricing is largely because the wages in Oz tend to be better than in the UK or the US. Yay for Australians but tougher for tourists. The good news is there is a huge amount to do for free, and if you get a place with a kitchenette you can fill up on a big breakfast before you go out. There is also no expectation to tip, and taxes are included as standard, which means the price you see is the price you pay. Free Tours Sydney offers a walking tour and a bus tour. Much like I’m Free Sydney, the tours are officially free but you tip the guide what you think the tour was worth. There’s not much pressure, so if you genuinely can’t afford it you don’t need to give anything, but by the end if you have the money you’ll think it’s only fair.The bus tour is a little different in that you pay $18 up front to cover costs, then add anything at the end you’d like to. We enjoyed the tour, and got to see some lovely views before ending up in Bondi. The guide, Martin, was enthusiastic but some of his jokes (especially the ones about the strip clubs in King’s across and where ‘young ladies’ could find rich old men) were not enjoyed by many. You get around 25 minutes at Bondi, so once that’s up either head back to the city with the bus or enjoy the beach and do the much recommended Bondi to Coogee walk, then jump on public transport to get back to where you want to be. The bus tour starts at 10.30am, but if you aren’t there by 10am you may well not get a space. The walking tour leaves from the same spot (Archibald Fountain in Hyde Park) so you can always go on that and reserve a spot on the bus for the next day. It also means you’ll be able to get on the bus before those who turn up the next morning, so a window seat will be all yours. Obviously you can look at this unique building from outside without paying a cent, which is more than enough for lots of people. However we really wanted to see inside so booked onto a guided tour, and were really pleased we did. Our enthusiastic and knowledgable guide told us about the history of the project, the controversy surrounding the architect, and how the performance areas are designed to achieve the best acoustics possible. On top of that we got to go backstage, saw some incredible views over the harbour, and, best of all, used our tour tickets to secure a discount to that evening’s performance. This isn’t guaranteed, but if there are tickets remaining then showing you’ve been on a tour can help. We got $110 tickets in the stalls for $49, and it was really brilliant. You get 10% off the tour – $36 per adult instead of $40 – if you buy online beforehand. If you have accessibility issues there is a lift, but if you’re just a bit unfit you’ll have to take the (many) stairs. The most historic part of Sydney, the Rocks is a great place to wander down cobbled laneways and learn about the convict settlement of the past, while enjoying excellent views and cuisine of the present. There are markets on every weekend, and a foodie market on a Friday. Full of ferry stops and pedestrian walkways, Circular Quay is predominately visited by commuters and tourists. You’ll find shops, restaurants, and great views. Make sure you nip behind to Customs House and once you’re through the foyer, without wanting to ruin the surprise, look down. Beautiful park filled with places where you can chill out, people watch, and plan your next jaunt around the city. Plenty of coffee shops and right next to the impressive St. Mary’s Cathedral. Disclaimer: I didn’t actually do the ferry ride on my most recent trip as it was too windy, but I’ve done it before and it’s definitely the cheapest way to get great views of the harbour. The round trip takes about an hour, or you can get off in Manly and spend some time at the beach. Don’t get the fast ferry – it’s more expensive and harder to enjoy the views. You’re looking for the big yellow and green boat leaving Circular Quay. Sydney is full of Escape Rooms – where teams need to solve puzzles and crack clues before the time runs out – and it was while searching for one of these on a rainy day that we came across the Sydney Virtual Room. None of us had ever done anything like it before and we really weren’t sure what to expect. After we found the entrance (it can be a little hard to spot from the street – it’s to the right of Superdry) we went up in the lift and came out into a bit of a geek gamers’ den. Despite not knowing much about it, and definitely not being gamers ourselves, we were made to feel really welcome and quickly started our session. It was odd to begin with – we were all in separate rooms not really sure how the whole thing would work – but once we got sorted with our headsets and the game was launched we had a great 45 minutes travelling through time, solving puzzles and even taking a selfie together. It was incredibly fun and really quite surreal at times – we loved it. $49 pp ($59 at the weekend) puts it at the more expensive end of Escape Rooms, but look out for vouchers online and visit on a weekday if you can. We had a lot of fun and, given that I’ve not seen anything like it before or since, would recommend it as a great indoor option when the weather is not on your side. After you’re finished, go around the corner to Gowings at the State Theatre for an excellent (but expensive) cocktail in a stunning Art Deco bar. A word of warning – if you’re an Escape Room enthusiast looking for highly complicated puzzles then this isn’t for you. The tasks are good and challenging enough, but the selling point here is the VR rather than the complexity. Hidden on small street between Wynard and The Rocks, this hipster cafe offers a great breakfast and coffee menu in a warehouse type setting. A reliable Australian chain, this won’t be the most interesting place you’ll eat but you’re guaranteed good food at a reasonable price. This Pyrmont cafe offers excellent brunch and good service. Probably the best place we ate at, Anason serves Turkish food and wine in a beautiful setting at Barangaroo Wharf. It won’t break the bank but it’s not cheap – the bill for three of us (including a bottle of excellent wine) was $200. The service was excellent and the waiters were very knowledgable. If you want a water side table then make sure you call ahead. We stopped here more for convenience and timing than anything else. It is a lovely location and the food was fine but we wouldn’t rush back. My friend was particularly taken aback by her fish being served whole – eyeballs, head, tail, bones – without any indication of that in the menu or from the staff. We spotted this on our way to the virtual room around the corner, and were so impressed by the architecture and decor that we made a detour to come back. The cocktails were delicious (but expensive), and the interior really is stunning. You can dine here too but we already had plans to eat elsewhere, which was just as well – as we left in our shorts and t-shirts, men in tuxedos and women in cocktail dresses began to arrive. Location, menus, and more info here. After we had been to a performance the Opera Bar seemed the obvious place to come. This lively bar, set outside the Opera House and opposite the bridge, serves a range of drinks with limited but good food (think cheeseboard, pizzas, and snacks). There are more food options if you go before a show than after. The price tag matches the location, but it was worth it for the overall experience. Sydney is a very expensive place to stay, and getting a room in a central location that’s both private (as opposed to a dorm bed) and clean for under $100 a night is almost impossible. If money is tight (or you’d just rather spend it on doing things in Sydney once you’re there) Siesta Inn is a good option. It offers private Queen Doubles in a very good location from $79 per night. This price also includes Wi-fi, use of laundry and kitchen facilities, linen, towels, and basic toiletries. The catch is that the bathrooms are shared. I know that this is a deal breaker for lots of people, but as someone who isn’t overly keen on them myself I had no problem over the four nights I stayed here. There were plenty of showers and sinks, I never had to wait – in fact I never actually showered at the same time as someone else – and they were kept really clean. Aside from a late check in experience which was slightly tricky (someone had gone on their break and not left a key for me) everything else was fine. The ‘Queen’ was two singles pushed together, which seems to be quite common, the Wi-fi was good, other guests were quiet (mainly single travellers and older couples), and although you could hear some outside noise at night this really is to be expected in a major city. My only complaint was that the blind wasn’t very thick – if you’re a light sleeper take an eye mask. It’s very easy to get to and from the airport as it’s just a few minutes’ walk from Wynard Station. I didn’t stay here but at over $1,000 for two people for six nights, my friends expected a little more from this – although that might be more about coming to terms with Sydney’s prices than anything else. They found their room to be quite small, the water pressure in the shower low, and the 250MB Wi-fi limit per code issued frustrating. They also complained about an intermittent bad smell coming from the bathroom drains and the amount of sound that made it through the windows. However, the rooftop pool and stunning views almost made up for it. More info on the Park Regis can be found here. A huge domestic and international airport means you can get to Sydney from pretty much anywhere in the world. A number of train stations, coach stops, and major roads allow plenty of options for those not flying. If you fly in then a taxi to the CBD will set you back $40-$50, or a range of shuttle buses operate with tickets around $20. Before you book a bus do some googling – a few companies on TripAdvisor have hardly any positive reviews, but plenty of stories of missed flights, ignored phone calls, and late pick ups. If you’re travelling alone (and therefore can’t split a cab fare) the train is probably your best option. Regular and reliable, the T8 goes from both the domestic and international terminals to key stops in the city, from which you’ll more than likely be able to walk to your accommodation. If not, you’ll be able to easily switch to a train that takes you closer. Get an Opal card (you’ll find it useful throughout your stay) and top it up with enough to cover the $17 fare. The airport charges most of this cost – if you don’t have lots of bags and don’t mind a 15 minute walk, head up to the next station, Mascot, (and get on the same train), and your ticket price drops to just a few dollars. Once you’re in the city the Opal card can be used on all public transport, including ferries. We mainly walked, but also got the odd cab later at night – request an uber on your phone or hail one of the many white taxis you’ll see on Sydney’s streets. 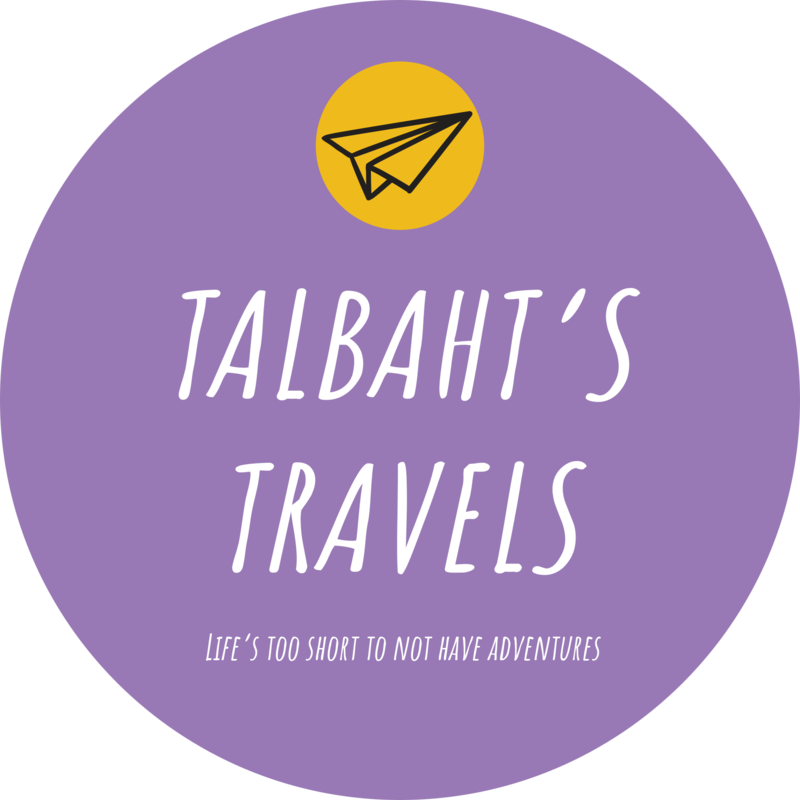 If you have any questions, want help planning a trip to Sydney, or have an idea for a guest blog please email contact@talbahtstravels.com.